Although we didn't expect it 2-weeks after we adopted our wonderful and beautiful Natalie (a badger marked purebred Great Pyrenees) she went into heat. As we were not expecting, we were not prepared and what do you know the Flat-Coated Retriever from down the road found favor in her. As they say, the rest is history and we now have 12 puppies. So as the second half of the title of this blog suggests, we now have puppies that need re-homing. These pups are a mix of purebred Great Pyrenees with badger markings (mom) and Flat coated retriever (dad) - see pictures below along with descriptions of both of these breeds. DESCRIPTION: The Great Pyrenees is also known as the Pyrenean Mountain Dog. The length of the dog is slightly longer than it is tall. The head is wedge-shaped with a slightly rounded crown and is in proportion to the rest of the body. The backline is level. The muzzle is about the same length as the back skull. The skull is ... See Moreas wide as it is tall with flat cheeks. There is no apparent stop. The nose and lips are black. The teeth meet in a scissors or level bite. The dark brown, medium sized eyes are almond shaped and slanted. The dark brown, V-shaped ears are carried low, flat and close to the head, rounded at the tips, set about eye level. The chest is fairly broad. The well feathered tail reaches the hocks and can be carried low, or up over the back in a wheel when the dog is excited. There is sometimes a crook at the end of the tail. The Great Pyrenees has single dewclaws on the front legs and double dewclaws on the hind legs. The dog has a weather-resistant double coat. The undercoat is dense, fine and wooly, and the outer coat is long, thick, coarse and flat. There is a mane around the shoulders and neck which is more apparent in male dogs. There is feathering on the tail and along the back of the legs. Coat is either solid white or white with patches of tan, wolf-gray, reddish-brown or pale yellow. TEMPERAMENT: The Great Pyrenees is a capable and imposing guardian, devoted to its family, and somewhat wary of strangers - human or canine. They are often used to guard livestock. When not provoked, it is calm, well- mannered, and somewhat serious. Courageous, very loyal and obedient. Gentle and affectionate with those he loves. Devoted to family even if self-sacrifice is required. It is very gentle with its family and children. LIVING CONDITIONS: These dogs are not recommended for apartment life. They need space, but adapt well to family life. They are not really active indoors, but would be happy with regular exercise outdoors or in a mid-to-large sized yard. Puppies are very active and might have the tendency to wander off or escape. The Great Pyrenees prefers cool climates. DESCRIPTION: The Flat-Coated Retriever is a beautiful medium to large sized dog. The head is long with a fairly flat skull. The muzzle is long, deep and strong with a gradual, slight stop. The large nose is black on black dogs and brown on liver dogs. The teeth meet in a scissors or level bite. The medium sized eyes ... See Moreare almond shaped and can be dark brown, or hazel. The well feathered ears are relatively small compared to the size of the head, hanging to the sides. The chest is deep and wide and the back is short and square. The strong feet are round. The medium length, thick, fine coat lays flat to the body and comes in solid black, or a solid liver, with well-feathered legs, tail and chest. TEMPERAMENT: The Flat-Coated Retriever is excellent with children and a great family dog, with a reliable temperament. Friendly, sweet and high-spirited, they love everyone, even strangers. They have a puppy-like attitude and always appear to be in good spirits. They love to play and retrieve, and with enough exercise they will be quiet indoors, saving the activity for the outside. They are intelligent, loyal companions. LIVING CONDITIONS: The Flat-Coated Retriever is not recommended for apartment life. It is relatively inactive indoors and will do best with at least an average-sized yard. This breed needs to be with his family to be happy. It does best when it is allowed to live inside and play outside. As noted previously these pups will be available to go to their new homes starting the week of June 1, 2010. If you have any questions about the breeds, the puppies, the adoption process, or would like to come down and pick out your pup in person, please email us at wagarfamilyfarm@att.net and we'll be sure to get back with you as quickly as we can. I have to say that one of my least favorite yard jobs is trimming... 1.5 years ago I went out and purchased my second gas trimmer (to replace the Ryobi that finally died). I purchased a sears one that promised a 1-pull start with auto-choke... Well, one of the reasons I hate to trim is because it takes 25+ pulls to get this two-cycle trimmer started.. Nonetheless, the kids can now play on their playset without fear of what's lerking in amongst the tall weeds and grass (3.5 feet tall at time of trimming. In just over 1 week, the Wagar Family Farm will be expanding it's chicken business. During the week of June 1, 2009, we will be receiving 15 more layers and 50 meat birds. I will post picks after they arrive. 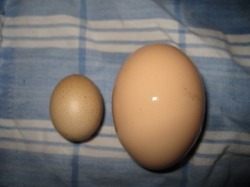 Not sure if one of our chickens just started laying, or our eggs are shrinking...go figure! So at what tempature do chickens become flash frozen? Well, based upon our experience last week, it's when the tempature is -10 degrees with a -25 degree wind chill. 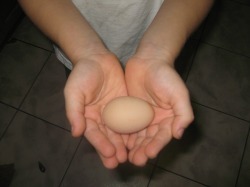 Yep, that's right, I went out to collect eggs and lock up the hens a week ago and found a frozen chiken. She was solid as a rock. It looked like she had frozen to death while roosting and just fell over. The other 25 ladies were just fine but I have since modified the coop slightly in order to reduce the about of airflow that wind can cause through the rafters. I also added 7 bales of straw to the interior allowing for more insulation. So far so good. End an up note, the ladies keep producing for us, as the 25 remaining hens are providing us with an average of 19 eggs per day. 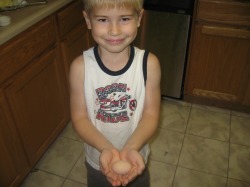 Looking for the Wagar Family Farm website? You're in the right place, but we have changed the name of our farm to Coyote Creek Family Farm in order to bring consistency between it and our homeschool, and a future venture called Coyote Creek Guns, a "kitchen table" style firearm dealer, specializing in the custom ordering of all types of firearms. No need to worry about the Farm's website address though, it will continue to be wagarfamilyfarm.weebly.com. As part of the name change comes logos for each of our ventures. This became a necessity as, Jennifer worked out a deal enabling us to sell our eggs at a local apple orchard, Apple Works. Next on the docket is to go purchase some blank egg cartons so that we can print out our logo onto stickers and apply them to the egg cartons for advertisement purposes and with the hope of being blessed by return customers. Well the title says it all. These days on the farm it just seems to be a whole lot of food, poop and eggs (the latter being the best of all). As fall ends and winter sets in we have migrated the ladies to their wintering spot on the farm. The coop and fence have been moved to a spot just in front of a couple of cedar trees that they loved to dig under. This spot is just close enough to the house that we can still put an extension cord our in order to connect the in-coop timered lighting which is needed in order to ensure egg production throughout the winter months. 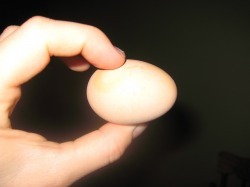 Did you realize that chickens need 16-18 hours of light in order to lay? The chickens have been in this area for about two weeks and so they have gone through pretty much everything on the ground which is why the feed consumption has increased. (No more worms and bugs for them to dig up). They did however enjoy the left over hot oatmeal for breakfast earlier this week as well as the left over tuna fish from lunch but most of all right now they are into their feed mixture. So what's the downside of the feed mixture, besides the cost? POOP.. That's right they poop like crazy.. I need to get in the coop tomorrow and clean it out but my goodness who woulda thunk (yeah that’s farm spelling) that 26 chickens could poop that much? I'll scrape out most of the poop tomorrow and provide them with some fresh pine shavings and it'll be back to normal, at least for a few more weeks. So is it all worth it? You know feeding and cleaning poop.....? It is when you get eggs. Speaking of eggs we're now averaging 18-20 eggs a day which means that our fridge is filling up fast but do you know what the best part is??? God and His creation is so very good! The Ultimate Easter Egg Hunt! The tractor's not getting much of a work out this time of year either, as the grass has really slowed down in its growth, which might I add is good and bad. You see the chickens really tear up the ground quite a bit, so I would prefer that it grew faster, however for the winter we're planning on arranging the coop in part of the yard that we don't mind if they tear up and then come spring we'll plant see there and let the circle of life thing happen all over again. It's also that time of year when the garden is pretty much finished. We had such a wonderful garden this year... It wasn't much to look at but the Cabbage, Bell and Hot Peppers, and Tomatoes were spectacular. Soon I will be tilling up the ground for the winter and I think at the same time we'll be tilling up another plot of land for a garden next year. Currently we have a 10x20 area and we'll probably double that for next year... With 4 kids and one on the way.. you can never have too much food. That's all for now, we love all and again sorry for not updating this site more frequently. Just a couple of High School Sweethearts, who married, and are currently homeschooling our four children while at the same time attempting to become semi-self sufficient on our 5-acre farm.